I’m back from DragonCon, and from my show this weekend at Disney Springs – had a fabulous time at both, thank you ALL so much for coming out to see me! I’ve got a lot of new beautiful paintings to tell you about today! The first of the new prints available is “12-Sided Dice Fairy” – you can see her here – we have prints, but the original has sold. Next up is “The Language of Flowers I: Forget-Me-Nots” – we have prints available here – the original *may* still be available from Corey Helford Gallery – $2400 – email Jan here or call (310) 287-2340. Similarly, we have the second in the series – “The Language of Flowers II: Pansies” – we have prints available here. I am 99% sure that the original has sold, but just in case I’ve been misinformed you can contact email Jan here or call (310) 287-2340 to double-check. In other painting news – I have a couple of pieces coming out in galleries soon! 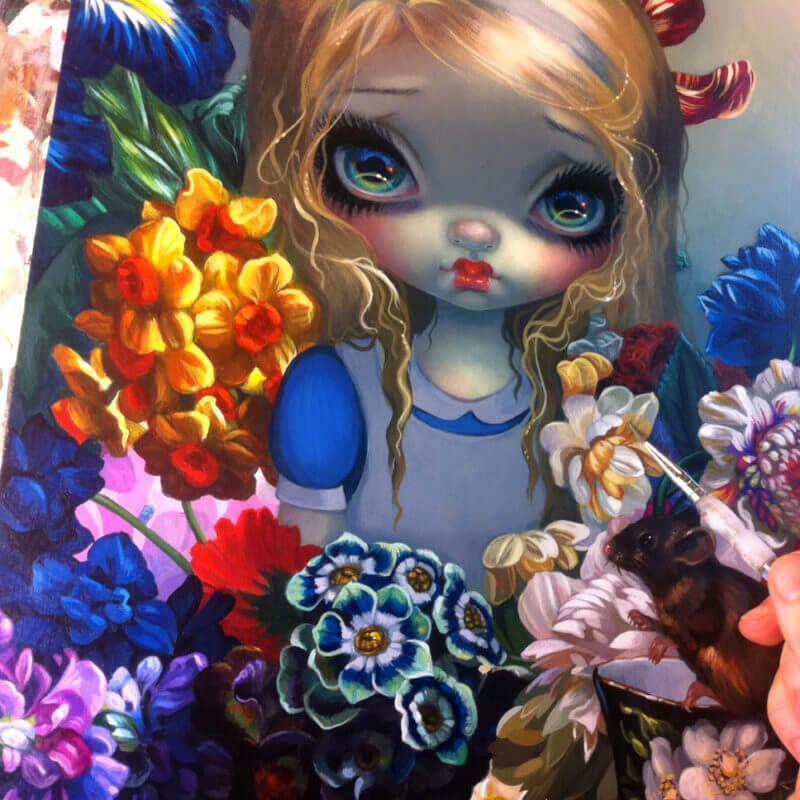 “Alice with the Dormouse” will be part of the Life Is Beautiful Festival (Las Vegas, September 23-26) “Crime on Canvas” show – if you are interested in the original painting, email Jay at [email protected] – here’s a sneak peek! Similarly, my “Femme Fatale” painting is going to debut at Modern Eden’s “Femme to Femme Fatale” art show in San Francisco this coming Saturday the 17th. A sneak preview of the painting in progress is below, if you are interested be sure to contact [email protected] . And finally in other news, the Kansas City Renaissance Festival is up & running in full swing! I’ll be there in person October 1, 2, 8, and 9) details here. Keep an eye out on the event page(s) – we’ll be doing daily print giveaways for costumes and other fun stuff at my gallery there. ← DragonCon, Shipping & the KC Renfest!